During user account creation, the Full Name field is generated by default in the FirstName LastName format. To change the format, you need to modify built-in Property Pattern User Pattern. Right-click the Full Name property and click Edit in the context menu. Modify the template in the Generate default value field. To generate property values based on values of other properties, you need to use value references (e.g. %username%). When creating or modifying an object, value references are replaced with corresponding property values of the object. If the user's first name is James and the last name is Bond, the full name will be Bond, James. In this example, the last name will be all uppercase, e.g. BOND, James. Optionally, modify the template for the Display Name property. 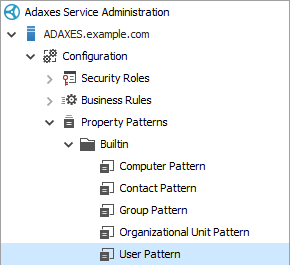 For instructions on how to modify the Full Name property of existing user accounts, see Rename Multiple Users in Bulk.